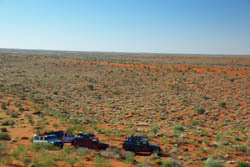 Track follows the route of C T Madigans 1939 crossing of the northern Simpson Desert. It avoids Camps 3, 4, 5 where permission is not able to be obtained from the aboriginal councils, instead travelling via the Pivot and the Crossing. We took a detour down to Geosurveys Hill, between camps 8 and 9. This route should not be taken lightly, it is some of the most remote area in the country and any vehicle failure will be extremely costly to recover (if possible) and possibly life threatening. Vehicle preparation should be meticulous. Distance between Finke and Birdsville (fuel stops) is in excess of 800km and mainly low range travel.